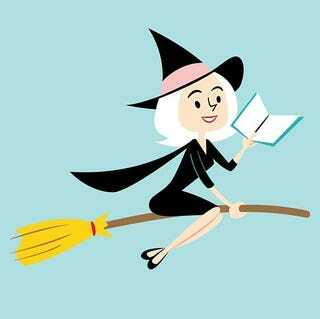 Public service announcement: No reading while flying brooms. The bright-eyed, fashionable occultist at left seems blissfully unaware that operating a moving vehicle while in possession of an open book can lead to serious injury or even death. This foolhardy sorceress is the creation of illustrator Craig Bostick, who is just one of the many talented contributors to the upcoming Book of Jezebel, which will be unleashed into the world on October 22. (Unlike the volume depicted in the illustration above, our book has words. And pictures.) We urge you to pre-order the book — best described as an illustrated encyclopedia of the world according to the sensibility of the site — here. The good news: You can follow our progress and learn about in-person readings and events on the book's dedicated website, Facebook page, Twitter feed and Tumblr. The bad news: You can't actually soar through the air on a thatch of straw attached to a wooden pole. Sorry.